Flow-Rite Inc., designs, supplies, inspects and installs High Density Pallet Racking Systems in Toronto and throughout Southern Ontario. Our solutions are well suited to a variety of storage environments, ranging from small facilities to multi-levelled warehouses. Using our extensive experience in multi-faceted warehouse racking systems, will analyze your needs to determine the right High Density Pallet Racking system for you. 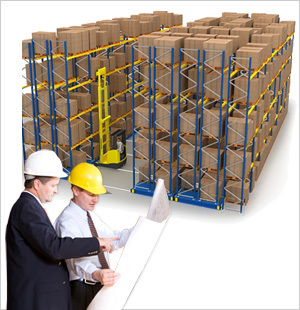 From an initial product and warehouse appraisal, we analyse your product types, pallet criteria, material handling equipment, available warehouse space, current pallet racking systems and warehouse shelving. This deeper understanding of your business operation forms the foundation in designing a warehouse storage solution that maximises your warehouse capacity and operational needs.